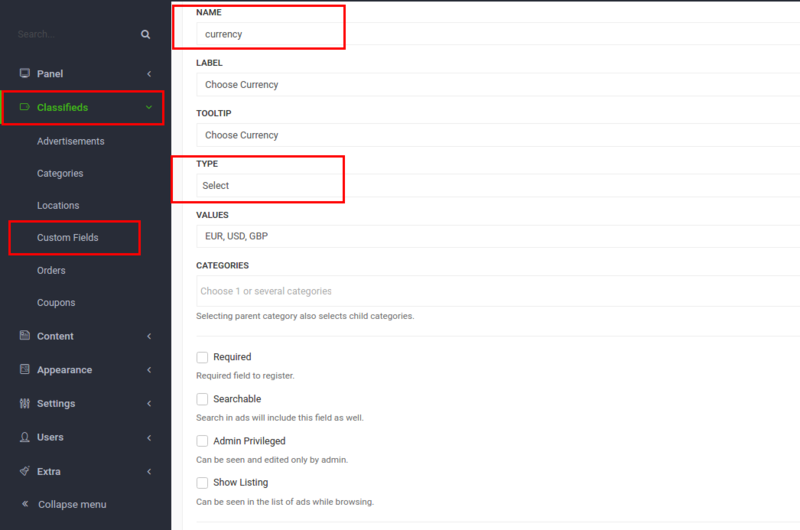 If you want to create an international website or just let the sellers of your website show and sell items in their currency, you can do it by creating the Currency custom field as described below. Go to your panel, Classifieds -> Custom Fields. It’s important to call the field currency. In the Type input choose Select. 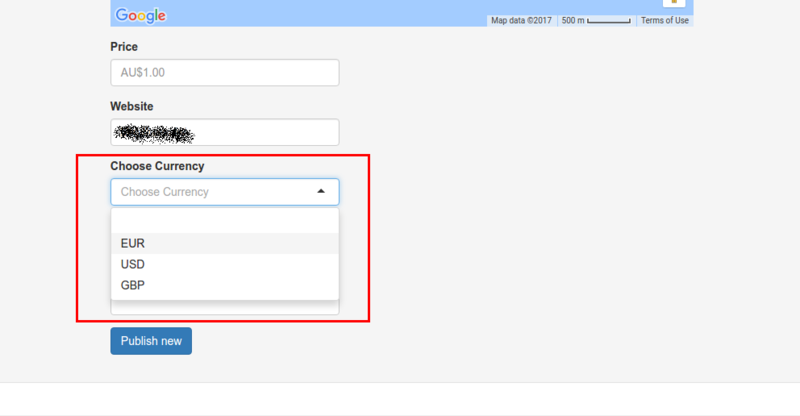 Now the field is created and sellers have the option to select a currency from the available options. AED, ALL, BDT, BGN, CAD, CNY, CZK, DKK, EUR, GBP, INR, HRK, HUF, IDR, JPY, NOK, PHP, PKR, PLN, RON, RSD, RUB, SEK, TRY, USD, VND, XAG, MOP, MDL, VEF, GEL, ISK, THB, MXV, TND, JMD, BWP, MUR, AZN, MGA, LBP, XDR, IEP, AUD, MMK, LYD, ZAR, IQD, XPF, TJS, CUP, UGX, PGK, TOP, KES, TMT, CRC, MZN, BYN, SYP, ANG, ZMW, BRL, BSD, NIO, GNF, BMD, SLL, MKD, BIF, LAK, BHD, SHP, SGD, TTD, SCR, BBD, SBD, MAD, GTQ, MWK, ITL, PEN, LVL, XPD, UAH, LRD, LSL, FRF, XOF, COP, CDF, TZS, NPR, GHS, ZWL, SOS, DZD, LKR, FKP, CHF, KYD, CLP, IRR, AFN, DJF, SVC, PYG, ERN, ETB, ILS, TWD, KPW, GIP, SIT, BND, HNL, BZD, DEM, JOD, RWF, LTL, WST, PAB, NAD, DOP, HTG, KMF, AMD, MRO, ECS, CYP, KWD, XCD, XCP, CNH, SDG, CLF, KZT, NZD, FJD, BAM, BTN, STD, VUV, MVR, AOA, EGP, QAR, OMR, CVE, KGS, MXN, MYR, GYD, SZL, YER, SAR, UYU, UZS, GMD, AWG, MNT, XAU, HKD, ARS.